The American country and gospel vocal group The Statler Brothers, usually known simply as The Statlers, began their career in the mid-1950s but became known to millions via their regular appearances on The Johnny Cash Show on ABC TV. As his accomplished backing foils Don and Harold Reid, Phil Baisley and Lew DeWitt (lead, bass, baritone and tenor/guitarist respectively) the quartet brought immaculate harmonies, complex time changes and a great deal of humor to proceedings and soon became a huge live draw in their own right. Justly famous for the lovely “Flowers on the Wall” (immortalized in Pulp Fiction) and the liberal sentiments of “Bed of Rose’s” they have released 40 albums and are well served in the store for their Mercury Records and Mercury Nashville compilations. Recipients of many major awards from the Academy of Country Music, Country Music Association and with three Grammy Awards to their name, they won the CMA’s Vocal Group of the Year nomination six years in a row from 1972 to 1977 and then grabbed the same gong three more times between 1979 and 1984. At their peak all their albums went either Gold or Platinum. Their biggest seller remains 1975’s The Best of the Statler Brothers and that would be the ideal place to discover their charming sound. Very nice if you can find it on original vinyl, ditto all their albums. 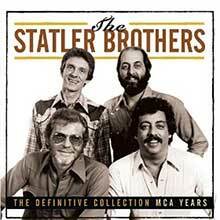 The Statler Brothers are well worth including in any discerning country music’s fans library. Formed in Staunton, Virginia, the Statlers emerged from their local church and gospel background and never really left that locale, despite increasing fame. Having hit the top of the Billboard charts four times with “Do You Know You Are My Sunshine”, “Elizabeth”, “My Only Love” and “Too Much on My Heart” they launched an annual Independence Day festival in Staunton with major guests stars like Charley Pride, Mel Tillis and others boosting attendances. Their debut album is Flowers on the Wall (1966) whose title track, penned by Lew DeWitt became their signature piece though it also contained the impressive “My Darling Hildegarde” and ace covers of material by Roger Miller (“King of the Road”), Chuck Berry (“Memphis, Tennessee”) and Johnny Cash (“I Still Miss Someone”). Sing the Big Hits and How Great Thou Art completed a trilogy of recordings for Columbia with producer Bob Johnson manning the desk on the middle disc that contains the hits “Ruthless” and the witty “You Can’t Have Your Kate and Edith, Too”. Switching to Mercury Records in 1970 and hooking up with producer Jerry Kennedy enhanced their reputation in Nashville and they were hot off the mark in championing the merits of label-mate Tom T. Hall and for covering Kris Kristofferson’s “Me and Bobby McGee” in 1970 on the immaculate Bed of Rose’s, also featuring “We”, “New York City” and “Neighborhood Girl”. The 1971 album Pictures of Moments to Remember included a superbly dexterous version of Bob Wills’ “Faded Love” and they began to utilize crack Nashville players like Charlie McCoy, Floyd Cramer, Harold Bradley and Pete Drake, who lent the Statlers a rounded and progressive sound. Other notable releases in this heady period include Carry Me Back, if only for the classic Western ballad “Whatever Happened to Randolph Scott” and Thank You World. The ambitious concept disc Short Stories and The Country America Loves did well for them as did their Christmas releases. In fact all the Statler albums recorded with Kennedy are excellent. Years Ago and The Legend Goes On saw them entering a smooth nostalgic phase culminating in a golden epoch that saw Today, Atlanta Blue and Pardners in Rhyme dominate the US country charts. For a handy introduction to their cool vocal breeze try The Definitive Collection, Gold or the anthology in our Icon series. But don’t just take our word for their brilliance. After all it was Cash who got them their first deal. "He took us to Columbia Records and said, 'Here, record these guys,' and sort of crammed us down their throats," Don said. They embody the maxim – attend to the show but also attend to the business. They should be a heard as a reminder of how great country music was back in the day before somewhat homogenized concerns took over. Old school for sure, but an addictive listen. 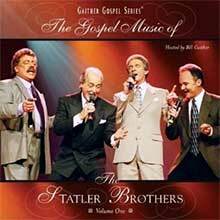 Discover the Statler Brothers and you experience the voice of America. The sound America loves. 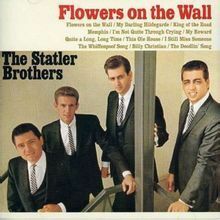 The Statler Brothers started their recording career at Columbia Records and cut eight albums for the label in five years, scoring eight country singles chart entries, including the Top Ten hits "Ruthless," "You Can't Have Your Kate and Edith, Too," and the pop Top Ten crossover "Flowers on the Wall." This 18-track compilation includes all those hits, along with standards like "The Wreck of the Old '97," "Green Grass," and the gospel pop song "Oh Happy Day," and one previously unreleased track, "Half a Man," which, despite having been recorded two years later, sounds like the logical follow-up to "Flowers on the Wall." The influence of the Statlers' employer, Johnny Cash, is apparent, especially on "Hammer and Nails," on which he appears. At this early stage, without losing the sound of the classic country quartet, the Statlers also sang pop, folk, and gospel well. The only complaint to be made about this set is that, in the CD age, a running time of 42:15 is short for a compilation (if typical of country music). But nothing essential is missing. 2CD set featuring 50 definitive tracks by The Statler Brothers including: 'Atlanta Blue', 'Only You', 'Moon Pretty Moon' and more. 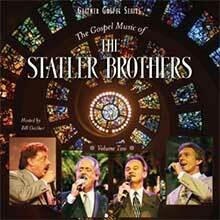 First of two volumes exploring The Statler Brothers gospel music. This volume features 19 tracks, including: 'Fourth Man', 'Jesus Hold My Hand' and 'Hide Thou Me'. The Statler Brothers (they’re not actual brothers -- they just sing like they are) began as a church vocal group, and while they went on to place hits on both the pop and country charts in a 45-year career, traditional church music and gospel remained at the heart of their sound and intent. For years the group hosted a variety show on TNN and would close each program by singing a gospel song around a lone piano, and this disc, the second volume of two (there are also matching DVD volumes), collects several of those intimate performances, along with a relaxed interview. It makes for a nice introduction to a vocal group that has become an American institution.